Finger puppet-maker extraordinaire Mullish Muse has designed handfuls upon handfuls of characters, from holiday standards to Presidential candidates. While these clever creations are appealing stocking stuffers, the fashion designer series, thus far consisting of Karl Lagerfelt (below), John Gallaineano, and Vivienne Westwool, and the rock star series may give rise to legal finger-pointing. Like other celebrities who invest in and profit from their images, fashion designers may enjoy rights of publicity under state law and in various non-U.S. jurisdictions. 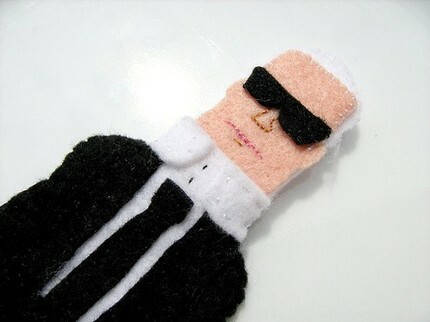 True, some might appreciate being immortalized in felt and sold on Etsy, but others might not -- and Karl Lagerfeld in particular is quite protective of his image. 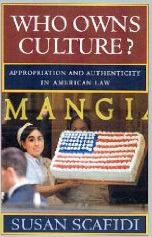 So while Ms. Muse carefully referred to the puppet's attire as an "Italian-style suit," avoiding a false designation of origin, and to the designer's "trademark ponytail" (not literally, but colloquially -- it's a signature style), the long arm of the law may ultimately stay her hand. In difficult economic times, some shoppers eschew luxury labels, while others turn to fakes. Still others avoid conspicuous consumption altogether, whether the logos are real or just look that way. But a few determined materialists may choose to indulge their every desire -- with the help of a five-finger discount. Shoplifters at Staten Island Mall, however, may find themselves featured in an unexpected photo layout. 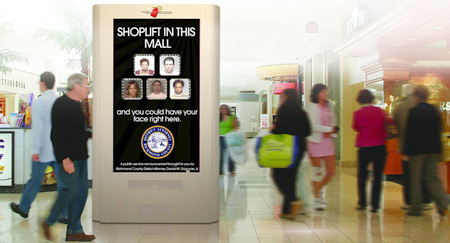 15-second ads on mall's electronic bulletin boards display mug shots of past shoplifters, and more faces may be added in the case of future arrests and convictions. A clever use of shame to deter crime -- unless delinquent attention-seekers find the idea of being part of the rogues' gallery too appealing to resist. In which case the mall will have to find other ways of humiliating thieves. Counterfeit Chic suggests forcing offenders to wear elf costumes and assist Santa -- though admittedly such a sanction may be both cruel and unusual. Fashion is an omnivorous medium. There's no aesthetic, subculture, or human experience that is too obscure, too violent, or too dark to serve as an inspiration for some creative designer. Given this hunger, not to mention fashion's fascination with the color black, it's no surprise that goth culture is reflected in many couture creations. An extraordinary exhibit at the Museum at F.I.T., Gothic: Dark Glamour, explores the roots of the modern goth aesthetic in Victorian mourning costume, as well as linguistic links back to the Dark Ages and to the ancient "barbarian" Goths themselves. From Alexander McQueen's skulls to Rodarte's "bloodstained" tulle to Yohji Yamamoto's sculptural folds, many modern designers have experimented with this visual vocabulary. While designer Rick Owens recalls his own goth youth, which gives his work an air of authenticity, only a few of the creators and wearers of elaborate goth-inspired clothing have any actual association with modern goth culture. This creative cultural appropriation didn't seem to bother the actual goth partygoers at the exhibit's opening earlier this fall, though. On the contrary, most seemed to enjoy both the exhibit and the attention from professional photographers and fellow guests who admired their dark finery. The animated goth denizens of South Park, however, are less sanguine about seeing their style copied. Check out the full episode -- or just a short clip -- to see how the clique that laid claim to morbid posturing responds to the new "vamps" in town. 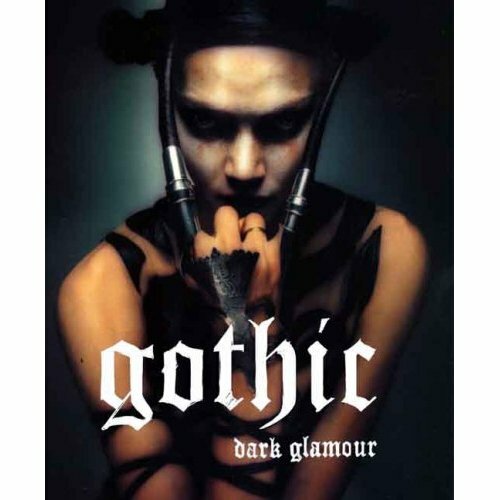 And then pick up the stylish Gothic: Dark Glamour book for the resolutely disaffected teenager on your holiday gift list. Just remember to wrap it in black, perhaps with a poisonous sprig of mistletoe for good measure. 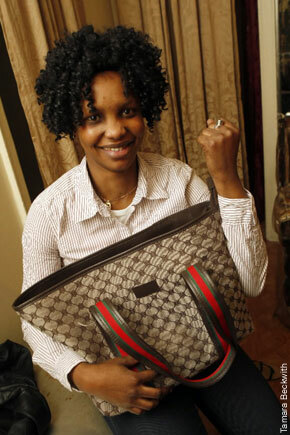 When three subway muggers snatched Marie Conde's fake Gucci bag, she not only gave chase -- she grabbed one of them by the arm and held on long enough for the cops to arrive. Of course, it wasn't the bag or even the money that Marie was concerned about, but her green card and other documents. Still, if she's going to take such a courageous and dramatic risk, it ought to involve better than a counterfeit. Or at least PR maven Kelly Cutrone thought so, and then made sure that Marie ended up with not one but two Longchamp bags, two sets of Alex and Ani "Spiritual Armor" bangles, and other luxury rewards. Who needs skin, skateboards, or automobile bumpers when you can express your identity -- or your brand obsession -- by decorating your laptop? From stickers on the outside to onscreen wallpaper, the possibilities are endless. Just to make the process easier, inju has invited you to "Pimp Your Mac!" 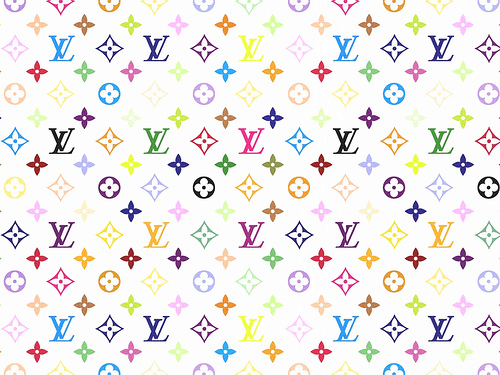 with a series of desktop designs (6 Louis Vuitton and 1 Gucci) posted on Flickr. And yes, PCs, this paradoxical combination of individuality and corporate conformity --along with its accompanying trademark and copyright violations -- works on any screen. In an amusing bit of intellectual property irony, inju has distributed these images under a Creative Commons license. A woman should mix fake and real. To ask a woman to wear real jewelry only is like asking her to cover herself with real flowers instead of flowery silk prints. Why is it that copying a jewelry design or a floral print fabric may give rise to liability under U.S. law, while creating a representation of a natural gem or flower is likely to cause neither legal nor ethical concerns? Why is it OK to curl a zipper to resemble a rose, but potentially problematic to curl a zipper to resemble another designer's zipper rose? Why would Coco Chanel (and the modern fashion house that still bears her name) celebrate fake pearls but not counterfeit logos? The reasons for intellectual property protection are complex and sometimes controversial, but such protection does not extend beyond human creations. 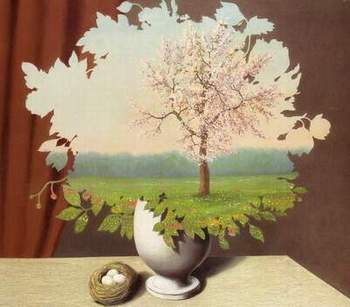 God, Mother Nature, or whatever atomic collision created the beauty of the natural world is not, legally speaking, an author or inventor. Even when a talented horticulturalist breeds a new variety of rose, and is duly recognized by the legal system, the scope of the patent does not extend to an artificial fabric representation of that partnership between plant and human animal, nor should it. Thanks to the fabulous Ariana Lindermayer for sending the inspirational image! Counterfeit Chic does not recommend using artificial scents to cover unpleasant odors. Perfume is alluring, but no substitute for a shower. A spritz of Febreze does not confer a dispensation from taking out the garbage. And if you feel the need to hang one of those tree-shaped air fresheners from the rear-view mirror, it's time to throw out the fast-food wrappers littering the back seat and clean the upholstery. Still, those Little Trees® have their fans -- including, it seems, some lurking in the forest of fashion. Hence the full-page ad that appeared in today's WWD, admonishing against using the familiar design without permission. It turns out that in the past year, the trademarked design has been the subject of lawsuits against both Old Navy and Rocawear, which incorporated the trees into (presumably unscented) T-shirts. 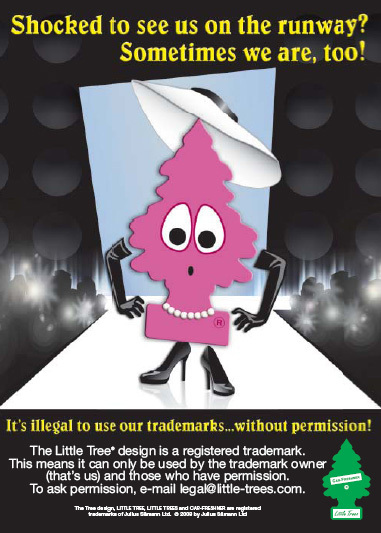 Given that the trademark holder also markets its own line of tree-bedecked clothing, the fashion labels couldn't quite mask the telltale aroma of infringement. Related posts: Admonitory ads from Chanel and Joseph Abboud. Fake Bags or False Allegations? Did paparazzi catch Karl Lagerfeld coveting counterfeits? As of yesterday, Jezebel.com seemed to think so -- but the entry is no longer searchable on either the blog or its original source, INF. Did Lagerfeld's lawyers get involved, perhaps with allegations of defamation? We can only speculate. It's worth noting, however, that no identifiable counterfeits (Chanel or otherwise) appear in the suddenly scarce photo. Strangers on the street often ask me questions. And not just at home -- I've been asked for directions in Paris, my opinion of a restaurant in Rome, and the time in New Delhi. I do my best to respond, language and jet lag permitting, but most of the time the question would be better answered by a local. Of course, freedom of speech does not guarantee Ms. Fox the right to speak in the pages of the Times, or indeed to advocate illegal activity at all. But her response does raise another question: The next time a tourist asks me how to get to Canal Street, should I graciously point her in the wrong direction?